Egyptian hieroglyphics tattoos are intriguing designs that garner second glances from people who wonder what they mean. There are a couple of ways to express yourself with the ancient Egyptian writing system. Hieroglyphics make up one of the world's oldest writing systems, and they are still considered aesthetically pleasing and intriguing today. They carry a certain air of mystery. Even a simple name would make an interesting tattoo. Just as hieroglyphics have kept scientists busy for centuries trying to unravel their riddles, you'll make people wonder about the secret meaning of your tattoo. You can express yourself with Egyptian hieroglyphics tattoos by choosing the symbols and going for phonetic or logogram interpretations, adding color, deciding from which direction the tattoo should be read, and integrating symbols into larger tattoos. There are myriad possibilities. Phonetic hieroglyphics represent letters of an alphabet that use only consonants. Logographic hieroglyphics, sometimes called ideograms, use one symbol to represent an entire word. When you use pictures in your hieroglyphics tattoos, you can write them from left to right, right to left or vertically. Just make sure they're facing the proper direction if you want them read right to left. Images that face the left mean the word or phrase should be read from left to right. Images that face right signal to read from right to left. 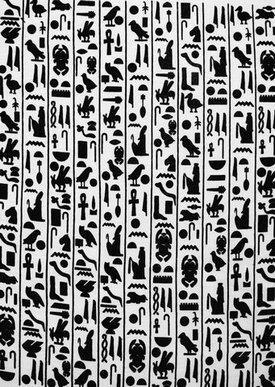 Tattoos featuring hieroglyphics are often done in just in black. That makes them an inexpensive choice, especially if you just want a small symbol or two. However, you may find that you want to add color accents that further personalize your tattoo choice. While it may be difficult to get an exact translation for your tattoo idea due to language differences, you can get close meanings. At Virtual-Egypt, for example, you can put in your "Pharaoh Name" and create your own cartouche. This model is based on comparing phonetic sounds and alphabet characters. Similarly, National Geographic has a translator. You can learn about more ways to incorporate Egyptian hieroglyphics into your tattoos at Egypt Art Site. You may also visit Tattoo Translate to translate phrases from English into several other languages, including hieroglyphics. While it's easy to make a tattoo featuring Egyptian hieroglyphics your very own, it never hurts to look at images of other tattoos or designs to get ideas. Tattoo Easily offers 45 examples of real tattoos. 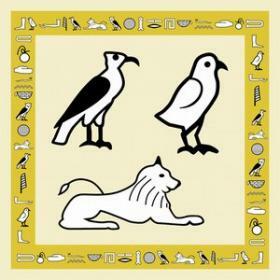 Some designs feature hieroglyphics; others are images of pharaohs, ankhs and other Egyptian designs. Free Tattoo Designs also shows hieroglyphic tats. However, there aren't quite as many images as there are on Evil Tattoo. TheKeep.org has the breakdown of the Egyptian alphabet with its 24 letters. You won't find any actual tattoos, but the symbols can easily be used as inspiration for a tattoo. If you love history, symbolism or just keeping people guessing, consider getting one of the millions of Egyptian hieroglyphics tattoos. Pair your own ideograms together to form a collage of thought or attempt to spell out a word with phonetic images from any direction, possibly within the confines of a decorative border.